Heat the oil in a pan. Sauté the onion, pumpkin, potato, apple and curry for approx. 3 mins. Pour in the stock, add the bay leaf, cover and simmer for approx. 20 mins. until soft. Remove the bay leaf, pour in the cream. Blend the soup, season with salt. Plate up the soup, sprinkle with the pumpkin seeds. 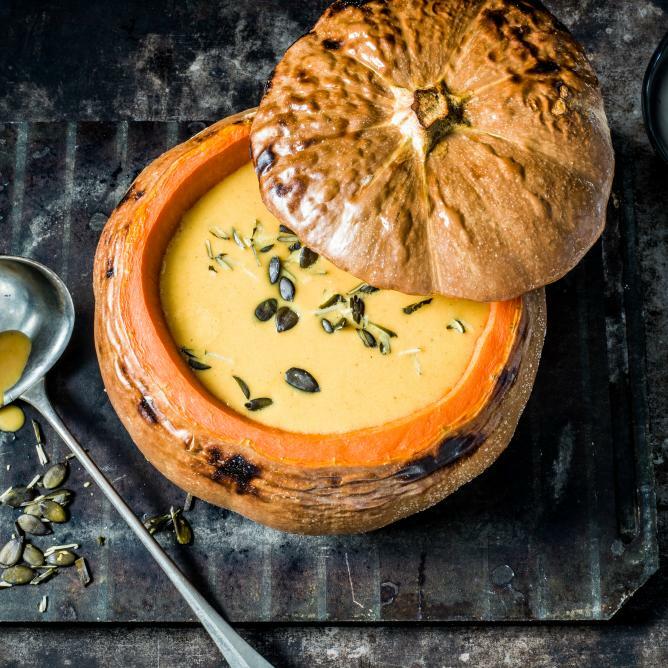 This soup can also be served in a pumpkin for special effect. Cut off the top of the pumpkin (e.g. Muscade) and set aside. Remove the pumpkin seeds and fibres. Bake the pumpkin (incl. lid) for approx. 15 mins. at 200°C. Scoop out the pumpkin flesh using a melon baller, leaving a border of approx. 1 cm. Make the soup using the pumpkin flesh and serve it in the hollowed out pumpkin.